Carrying just 227 guests in luxurious style, the magnificent Royal Clipper, with a complement of 42 sails, is modern in every way. Enjoy adventure, impeccable service, stunning accommodations and mouthwatering culinary choices that make this incredible yacht the perfect vacation choice. Offering the ultimate sea-going experience, she visits magnificent ports often untouched by larger cruise ships. Boasting a 19,000-square-foot open deck and three pools, guests can enjoy a spacious and expansive outdoor environment. 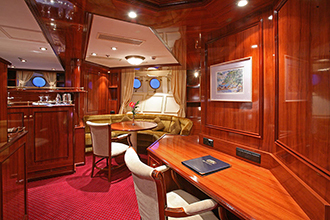 Royal Clipper also features a marina platform that lowers from the stern, convenient for watersports. More relaxation is offered at the fabulous spa, which boasts unique underwater glass portholes. Catch up on your reading at the stunning Edwardian-style library, with a glowing Belle Époque fireplace. Delicious cuisine is served in the elegantly appointed and plush three-level dining room with a décor of navy blue and gold, dark wood paneling, stunning blue murals, sailing ship paintings and ornate ironwork railings. Enjoy relaxed open-seating, so you can dine when and with whomever you choose in the sophisticated restaurant. With a no-tie dress code, dining is relaxed as you savor delicious international cuisine, complemented by fine wines. Lavish breakfast and lunch buffets offer a wide variety of culinary choices and fun barbecues are often featured. Blissful relaxation is offered in the sailing ship's stunning accommodations as you sail to distant lands, including 14 deluxe suites with private verandahs, a whirlpool tub and 24-hour room service. All but six of her 98 cabins are outside and two 355-square-foot owner's suites may be combined to accommodate up to eight guests, ideal for extended family cruises. 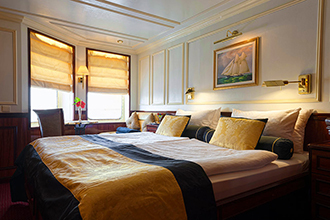 Twin beds or a double bed can be converted to a queen, and all staterooms feature a marble bathroom, private safe, TV with in-house video, DVD player, direct-dial phone and hairdryer. Designed for comfort, ease and efficiency, the stunning décor includes burnished brass fittings, mahogany trimmings and soft natural fabrics, with delightful colors reflecting the sea, sun and sky. Evening entertainment revolves around the fun open-air Tropical Bar. Boasting a long marble and wood bar, it is perfect for pre-dinner drinks and hors d'oeuvres. Perfect for the weekly captain's cocktail party, is the elegant Piano Bar, where you can also listen to delightful music from a beautiful white baby grand. Local performers also come onboard to provide an authentic taste for the destination's music and arts. Enjoy live bands play tropical tunes as you share the conviviality of fellow shipmates, as well as the Captain and crew, who often join in. Storytelling about the fascinating history of Star Clippers is enjoyable and adds a unique insight, enriching the fabulous experience of a Royal Clipper cruise. Cruise on the Royal Clipper to worldwide destinations, including Mediterranean, Caribbean and Transatlantic & Repositioning. 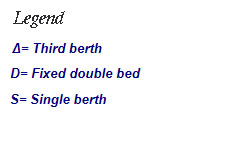 Deluxe Outside Deck Stateroom, Double Bed, Minibar, Private Marble Bathroom with Whirlpool Bath, Cabin Doors Open onto Deck. 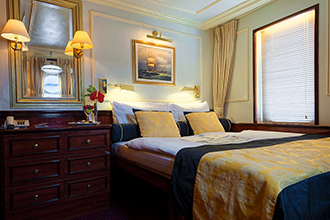 Superior Outside Stateroom, Two Lower Beds Convert to Double Bed, Private Marble Bathroom with Shower. 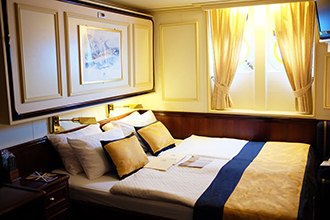 Outside Stateroom, Two Lower Beds Convert to Double Bed, Private Marble Bathroom with Shower. 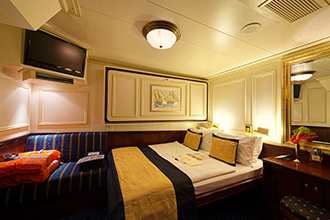 Outside Stateroom, Fixed Double Bed, Private Marble Bathroom with Shower. 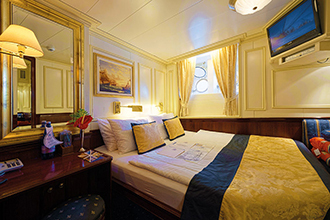 Inside Stateroom, Fixed Double Bed, Private Bathroom with Shower. Super Deluxe Outside Suite, Two Double Beds, Seperate Sitting Area, Minibar, Private Marble Bathroom with Whirlpool, Room Service. Cool off with a dip in one of our pools.